Google+ has largely been heralded as dead, and that isn’t for no reason. Most recently, Google has decided that it’s time to stop pretending like people want it, and has started decoupling its other services from the infamous social network wannabe. For those that just couldn’t stand the fact that Google was pushing them into something they didn’t want, I guess that’s great. Google is listening to feedback, and they’re acting on it. But for me, Google+ is an invaluable part of my daily routine. There is so much interesting commentary and conversation that happens there that I can’t imagine a day without it. I’ve made friends on Google+. I’ve had some of my most viral social media postings go viral on Google+. I’ve talked with Google employees personally on Google+. I have the ability to write about Google and its products in-depth partly because of Google+. And no, this isn’t satire. None of my real-life friends use it, and my grandma definitely doesn’t share any memes there. In fact, a lot of my online friends don’t have Google+ accounts, and those that do don’t use use them. Who says Google+ has to be Facebook, though? There is a select group of people that I follow — about 1,000, actually — that use Google+ every single day. I interact with dozens of posts every day, I share a fair number of my own, and I’ve met some amazing people. And that’s where Google+ shines. While Facebook and Twitter are so ubiquitous at this point that almost anyone you meet in real life has an account, only a select few diehards — although surely in the realm of tens or hundreds of thousands — use Google+. Right now, Google+ is largely a community full of Google fanboys, but that’s not all bad. If you’re looking to talk about Google or anything related to the Mountain View company, there’s arguably no better place. While people still complain about the fact that the default Google+ feed isn’t exactly chronological, there are plenty of corners of the social network that are. The best example are Communities, which are a bit like more open-doored Facebook groups. While Facebook groups seem to work best in private with just a dozen or so people, Google+ communities were built for thousands to share and converse about the topics they care about. Some of them have gotten so large, like the unofficial Android community, that they’re really hard — if not impossible — to keep up with. But there seems to be a sweet spot, somewhere in the realm of the tens of thousands, that communities seem to do a really good job of fostering good discussion. The perfect example is the Glass Explorers community of about 45,000. Back in the day, this little corner of the internet was thriving with fanboys of the new tech. When you become part of one of these communities, you start to see familiar faces and names. You get to know people, and you end up adding people to a circle. You then start to follow their regular Google+ profiles where they post some of the more “normal” social posts, and you make friends. I’ve gotten to know dozens of people through Google+ alone, and then gone on to meet them at events like Google I/O and CES. It’s the exact opposite of what happens with other social networks. With Twitter, you meet someone and glance down at their event badge or their business card to look them up and add them. With Google+, I found that I had met dozens of people with similar interests — namely, Google, Android Wear, Glass, and more — online, who I was ecstatic to meet for the first time in person. It’s kind of like a secret club, and if you’re on the inside, there’s a big community to be a part of. But the catch is that you have to really, really like Google. Some corners of Google+ are a bit circle jerk-y and bash Apple like I’ve seen nowhere else, praise the “Lord Duarte” (see: Matias Duarte) as their savior responsible for Android’s success (Okay, that’s everywhere), and religiously post the #pixelpushing hashtag alongside countless reaction gifs making fun of OnePlus and the other less-than-popular Android OEMs (and Apple). It sounds like a miserable little niche community to most, but if you’re reading 9to5Google (and especially this op-ed), you’re probably in the group of people that like Google enough to at least take a look and see what it’s like. Admittedly, though, it’s not for everyone. In fact, it’s not for most people I’d say. And that’s why the social network is largely considered dead. In comparison to Facebook or Twitter, it has been dead since day zero. Nonetheless, I use it every single day. I stumble on some great discussions about Google and technology in general, and it’s really awesome to see more interaction from my Google+ following than I’ve ever seen on Twitter. My Google+ following might give me 5 reshares, 20 comments, and 17 favorites for a piece of exclusive Google Glass reporting, while my Twitter following (of about the same number) just skips right by. But good luck to me if I share anything related to Apple, or any other company that competes with Google. That’s going to land on deaf Google fanboy ears, and nothing but trolling and bashing will be the result. 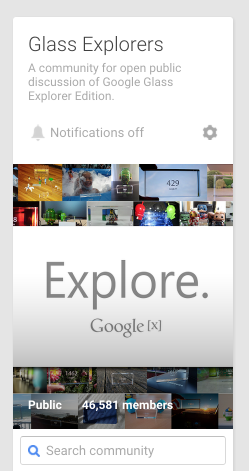 But considering all, Google+ is great for some things. It’s great if you want to talk about Google with other people that like Google, and plenty of those people exist. If you don’t fall into that category, maybe you shouldn’t bother. But if you do, like me, you might give it a shot and see how things go. I’d suggest starting with the Android Wear community, the Project Tango Developers community, the Chromebooks community, and our page (oh, and my profile!). You might be pleasantly surprised. Update: Case in point. I shared this post about how much I love Google+ on Google+ and it got interacted with by almost 40 people. 30 “plusses” and 8 comments so far, and I’m sure many more are coming.